The hematology diagnostics market can be segmented based on product type, which includes hematology instruments and hematology consumables. 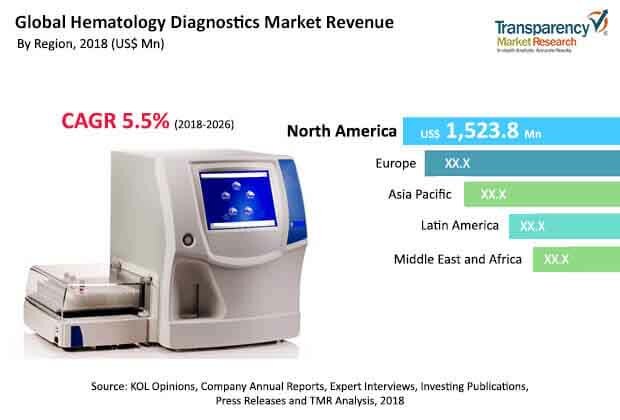 In terms of revenue, the global hematology diagnostics market was valued at approximately US$ 3,495.0 Mn in 2017 and is anticipated to reach approximately US$ 5,586.4 Mn by 2026, expanding at a CAGR of more than 5.0% from 2018 to 2026. The expansion of hematology consumables segment is likely to fuel the growth of global hematology diagnostics from 2018 to 2026. Rapid expansion of the global hematology diagnostics market is attributed to the increase in prevalence of blood disorders. Rise in awareness about these disorders among health care professionals and patients is projected to increase the demand for hematology diagnostics. For instance, approximately every three minutes, one person in the U.S. is diagnosed with blood cancer. Nearly 172,910 people in the U.S. were diagnosed with leukemia, lymphoma, or myeloma, in 2017. New cases of leukemia, lymphoma, and myeloma are expected to account for 10.2% of the estimated 1,688,780 new cancer cases diagnosed in the U.S. in 2017. An estimated 1,290,773 people in the U.S. are either living with, or are in remission from, leukemia, lymphoma, or myeloma. Hematology testing devices have come a long way from disease detection and monitoring to counting and characterizing blood cells. The concept of automation has extended to detect small cell populations in order to diagnose rare blood conditions, which requires less labor, rapid result, and easy-to-use analyzers. Current technologies include automation of hematology analyzer, electrical impedance, flow cytometry, and fluorescent flow. Combination of these technologies has increased the yield and productivity of test results. Test volume, i.e. number of tests performed, is projected to increase owing to technological advances in disease diagnosis and the rise in demand for preventive diagnosis and treatment monitoring. This is also augmenting the demand for hematology analyzers with high throughput. Such technological revolution in hematology testing is expected to propel the market during the forecast period. Hematology diagnostics market is witnessing expansion. Key market players such as Abbott Laboratories, Sysmex Corporation, F. Hoffmann-La Roche Ltd., and Beckman Coulter, Inc. have a strong presence in the global hematology diagnostics market. The global hematology diagnostics market has witnessed high investments by various multinational manufacturers such, Abbott Laboratories, Sysmex Corporation and F. Hoffmann-La Roche Ltd in the last few years. The hematology diagnostics market is driven by significant demand for laboratory automation and consolidation in order to improve precision and efficiency, and advancement in technology leading to easy usage. For example, in April 2018, Danaher (Beckman Coulter, Inc.) received CE Mark of its DxH 520 hematology analyzer, which is designed to help physician office laboratories. Another example, in January 2017, Roche announced the launch of the new, hematology testing solution, the Cobas m 511 integrated hematology analyzer. Cobas m 511, uses a unique approach through patented Bloodhound technology for printing, staining, and imaging. The global hematology diagnostics has been segmented based on product type, end-user, and geography. Based on product type, the market has been split into hematology instruments and hematology consumables. The hematology consumables segment led the market and is expected to continue its dominance during the forecast period. Factors such as rise in awareness of blood disorders among health care professionals and patients are projected to increase the demand for hematology analyzers and consumables. The hematology instruments segment is likely to lose market share during the forecast period. Among the hematology instruments segment, hematology analyzers was the leading sub-segment in 2017. The sub-segment is likely to account for a leading share of the segment of the market during the forecast period. Among the hematology consumables segment, reagents segment was the leading sub-segment in year 2017. It is and anticipated to dominate the segment of the market during the forecast period. In terms of geography, North America held a major share of the global hematology diagnostics market in 2017. Technological advancements in instruments, ease of usage, and favorable reimbursement scenario drives the hematology diagnostics market in the region. The U.S. and Canada are rapidly advancing the frontiers of research and technological development as well as setting stringent standards for analysis of blood products quality. This, in turn, is likely to propel the hematology diagnostics market in North America during the forecast period. Asia Pacific is witnessing rapid development. High per capita income has increased utilization of diagnostic and therapy products in the region. Rapid expansion of the market in the region can be attributed to numerous government initiatives undertaken to improve the health care infrastructure. Development of health care infrastructure, rise in population, boom in the biotechnology industry, and increase in burden of diseases requiring diagnostic tests are propelling the hematology diagnostics market in Latin America and Middle East & Africa. Key companies operating in the global hematology diagnostics and profiled in the report include Abbott Laboratories, Sysmex Corporation, F. Hoffmann-La Roche Ltd., and Beckman Coulter, Inc. These players are adopting advanced techniques to develop hematology diagnostics and in order to expand their product offerings, strengthen their geographical reach, increase customer base, and garner market share. For instance, in June 2017, Abbott Laboratories announced the availability of Sekisui’s CP3000 coagulation analyzer in Europe, the Middle East, and Asia Pacific. In another instance, in March 2015, the diagnostics division of Siemens Healthineers launched three new scalable hematology systems: ADVIA 360 System, ADVIA 560 System, and ADVIA 560 AL System. The hematology diagnostics market has been segmented based on product type, end-user, and geography. Based on product type, the hematology diagnostics market has been classified into hematology instruments and hematology consumables. In terms of end-user, the market has been segregated into diagnostic laboratories, hospitals & clinics, academic institutes, and others. Based on geography, the market has been segmented into North America, Europe, Asia Pacific, Latin America, and Middle East & Africa. The research is a combination of primary and secondary research, conducted for understanding and arriving at trends, used to forecast the expected revenue of the hematology diagnostics market in the near future. Primary research formed the bulk of our research efforts with information collected from in-depth interviews and discussions with a number of key industry experts and opinion leaders. Secondary research involved study of company websites, annual reports, press releases, investor presentations, analyst presentation and various international and national databases. The report provides estimated market size in terms of US$ Mn for product, application and geography for the period 2017 to 2026, considering the macro and micro environmental factors. The revenue generated from each product and application was calculated by considering the hematology diagnostics market product sales. The market report comprises an elaborated executive summary, which includes market snapshot that provides information about various segments of the market. It also provides information and data analysis of the market with respect to market segments based on product type, end-user, and geography. The market overview section of the report analyzes market dynamics such as drivers, restraints, and opportunities that influence the hematology diagnostics market in the current and future scenario. The report also provides the Porter’s five forces analysis, the acquisitions timeline of the hematology diagnostics market companies, SWOT analysis of the market, key vendor and distributor analysis, and comparative analysis of the hematology diagnostics market. Market share analysis among the market players is analyzed to signify the contribution of these players in the market in terms of percentage share. All these factors will help the market players to decide about the business strategies and plans to strengthen their positions in the global market. Based on geography, the market has been analyzed for major regions: North America, Europe, Asia Pacific, Latin America, and Middle East & Africa. The study also covers detailed country analysis contributing majorly in the hematology diagnostics market. The report also profiles the major players operating in the market and provides various attributes such as company overview, financial overview, product portfolio, business strategies, and recent developments. Companies profiled in the hematology diagnostics market report include Abbott Laboratories, Sysmex Corporation, F. Hoffmann-La Roche Ltd., Beckman Coulter, Inc., Bio-Rad Laboratories, Inc., Mindray Medical International Limited, Siemens Healthineers, HORIBA, Ltd., HemoCue AB, and Danaher (Beckman Coulter, Inc.).